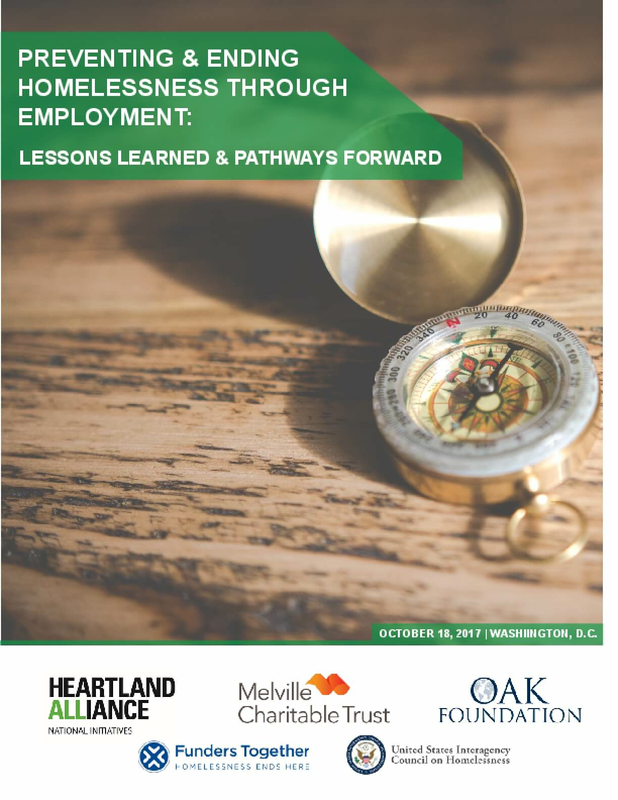 Heartland Alliance, in partnership with Funders Together to End Homelessness, the United States Interagency Council on Homelessness, and with the support of Melville Charitable Trust and the Oak Foundation, convened over 60 stakeholders in October 2017 for the Preventing & Ending Homelessness through Employment: Lessons Learned & Pathways Forward summit in Washington, D.C. The event brought together and galvanized a cross-section of experts including individuals with lived experience of homelessness, community-based organizations, government partners, philanthropy, national workforce, homelessness, and anti-poverty policy experts, and researchers to consider the lessons learned, challenges, and successes in supporting pathways to employment and economic mobility for individuals who have experienced homelessness or housing instability. In particular, lessons were drawn from Heartland Alliance's efforts to seed, incubate, and spread public systems collaboration efforts through the Connections Project, which is focused on increasing employment and economic mobility for individuals who have experienced homelessness or housing instability. 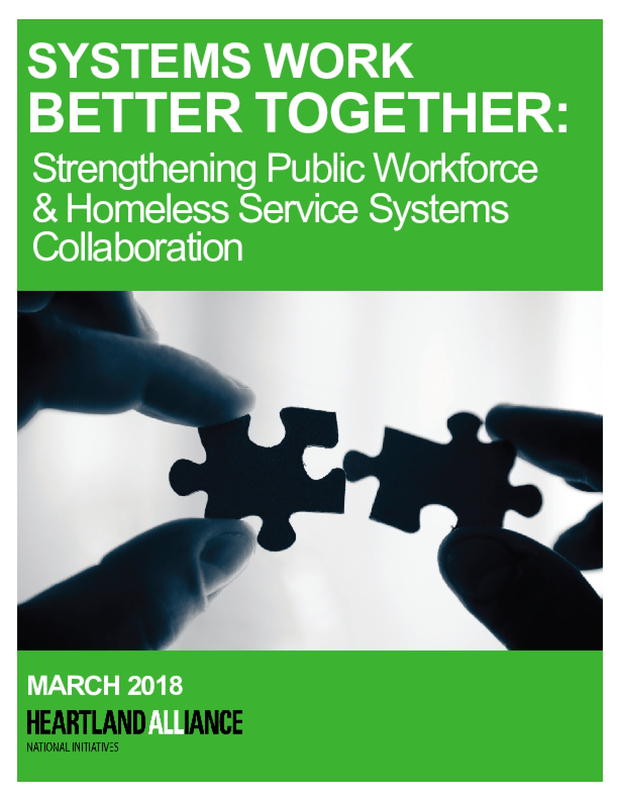 Drawing from in-depth interviews with public workforce and homeless service systems leaders and the work of our five Connections Project sites, this paper identifies common barriers to public workforce and homeless service systems collaboration and recommends how to address these barriers in order to help ensure that homeless and unstably housed jobseekers can access economic opportunity and stabilize in housing. Preventing & Ending Homelessness through Employment: Lessons Learned & Pathways Forward A national summit in collaboration with Heartland Alliance, the United States Interagency Council on Homelessness, and Funders Together to End Homelessness along with the support of the Melville Charitable Trust and the Oak Foundation. 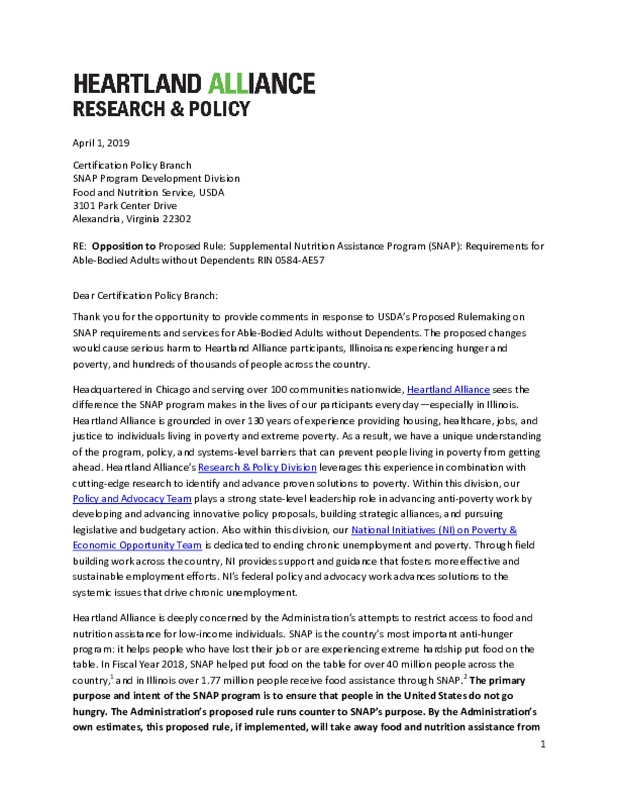 These are Heartland Alliance's comments in response to the USDA's Notice of Proposed Rulemaking regarding the expansion of work requirements for childless adults receiving food and nutrition support via the Supplemental Nutrition Assistance Program (SNAP). As these comments reflect, the proposed changes would cause serious harm to Heartland Alliance participants, Illinoisans experiencing hunger and poverty, and hundreds of thousands of people across the country. 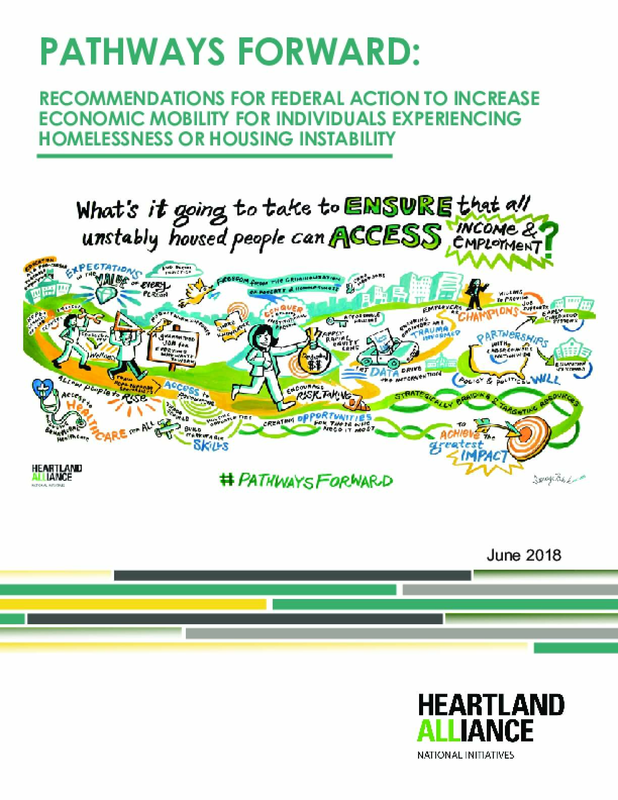 Heartland Alliance strongly opposes any rule changes that will result in people losing access to basic supports such as food and nutrition assistance. Instead, we urge the Administration to focus its time, attention, and resources on implementing proven approaches to ending poverty and advancing employment and economic opportunity for ALL. 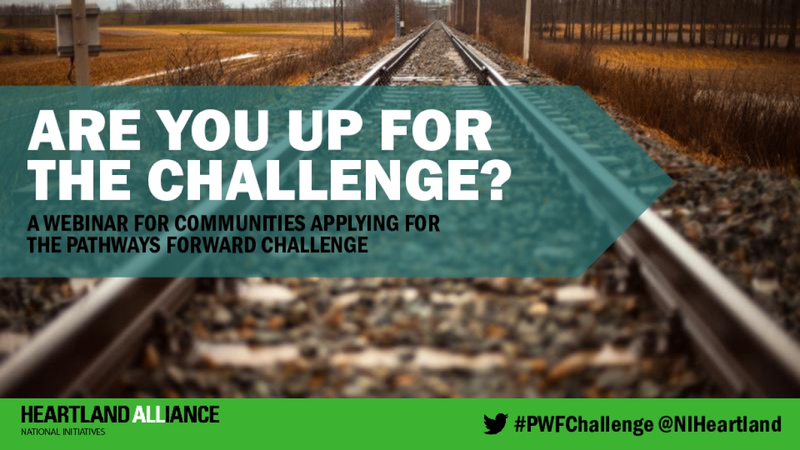 This webinar provided information and clarity around how to prepare and submit a strong proposal for the Pathways Forward Challenge Grant. This webinar was moderated by our Project Manager, Carrie Felton, along with other National Initiatives staff and they covered the key elements of the challenge, the characteristics of the communities, teams and ideas we're looking for, and answer questions you may have. 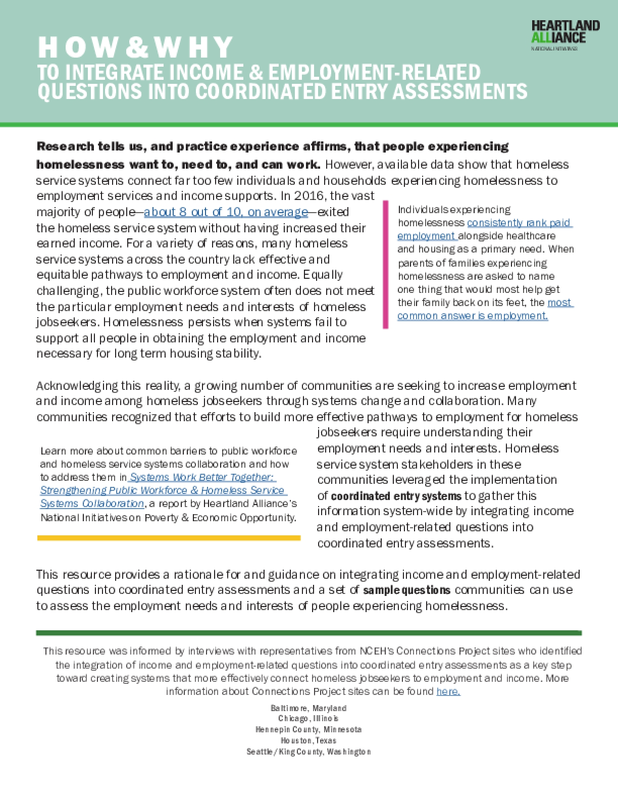 This resource provides a rationale for and guidance on integrating income and employment-related questions into coordinated entry assessments and a set of sample questions communities can use to assess the employment needs and interests of people experiencing homelessness. 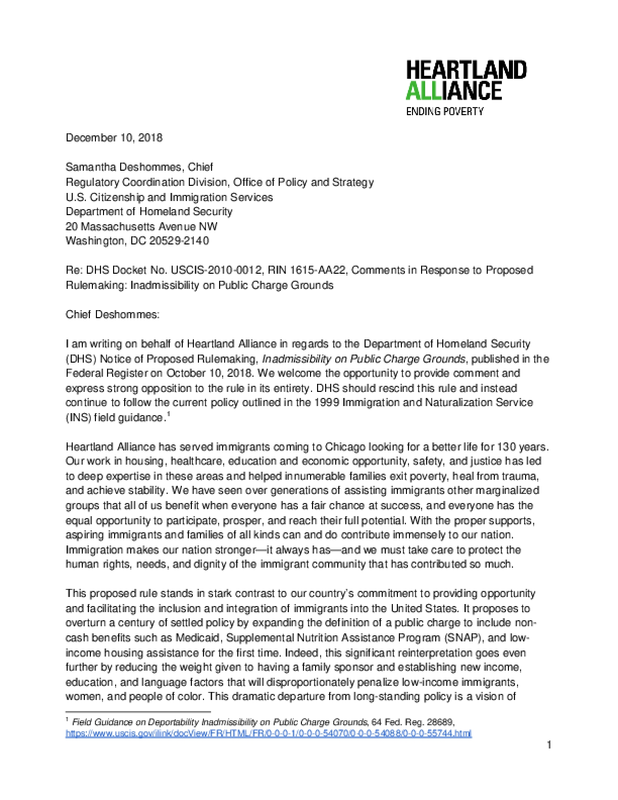 Comment letter from Heartland Alliance in in regards to the Department of Homeland Security (DHS) Notice of Proposed Rulemaking, Inadmissibility on Public Charge Grounds, published in the Federal Register on October 10, 2018, expressing our strong opposition to the rule in its entirety. 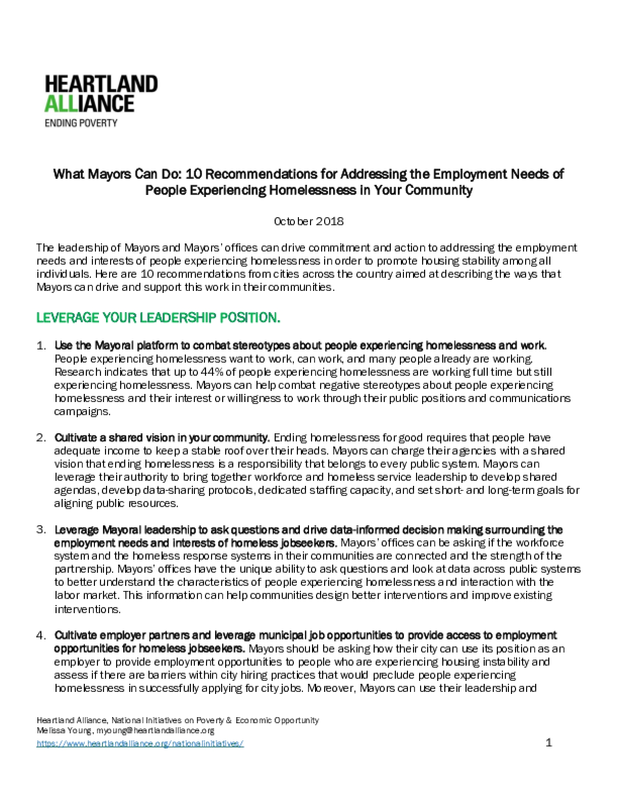 The leadership of Mayors and Mayors' offices can drive commitment and action to addressing the employmentneeds and interests of people experiencing homelessness in order to promote housing stability among allindividuals. Here are 10 recommendations from cities across the country aimed at describing the ways thatMayors can drive and support this work in their communities.